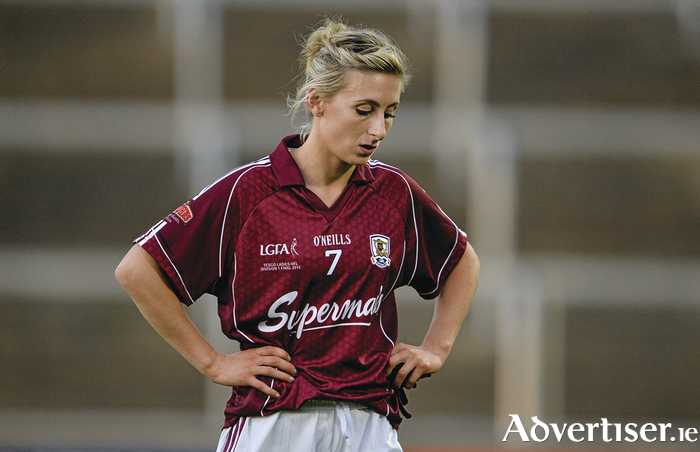 A dejected Sinead Burke after Galway lost the TESCO HomeGrown Ladies National Football League division one final replay to Cork on Sunday. The Galway ladies had to endure yet more league final disappointment when going down by 0-14 to 1-10 to Cork last weekend in O’Moore Park in the National League division one final replay. Cork led by 0-10 to 1-5 at half time, coming from behind after Patricia Gleeson’s terrific 26th-minute goal handed Galway a 1-5 to 0-7 advantage. Cork were profligate all through the game, shooting 14 wides, and those misses gave Galway a real opportunity to win what would have been their first division one league title. It was a game that Galway could have won. In the last quarter they gave up possession too easily, especially from their own restarts, and it is something they need to work on for the championship. However another key factor was a harsh yellow card and a sin binning to team captain Ger Conneally in the last 10 minutes, which was to have a big bearing on the game. Galway led by one point at that stage, but Cork pushed on and grabbed the winning scores to register their ninth league success since 2005 and prove why they have been the best team in the country for the past decade. A positive for Galway is that over the two hours of football they were extremely competitive and, with a bit of luck and a little bit more ruthlessness in front of goal, they could be league champions. Hopefully those two performances provide a platform for a good run in the championship. Scorers for Galway: P Gleeson 1-0, T Leonard (1f ) & A Clarke (1f ) 0-3 each, B Hannon, L Ward, C Concannon & M Hoey 0-1 each. Galway: Johanna Connolly, Sarah Gormally, Emer Flaherty, Áine Seoighe, Noelle Connolly, Nicola Ward, Sinead Burke, Annette Clarke, Geraldine Conneally (cpt ), Barbara Hannon, Patricia Gleeson, Louise Ward, Olivia Divilly, Tracey Leonard, Edel Concannon. Subs: M Hoey for N Connolly (21 ), L Joyce for Concannon (49 ), C Cormican for Divilly (58 ), R Leonard for Hannon (60 ).